Crystal clear water in your saltwater aquarium is the result of a job well done by someone who obviously takes fish care seriously. It lets you see your water-dwelling pets in greater detail too. But keeping the water clean is much more than a matter of pride and visual appeal. Fish and other marine life that inhabit saltwater require a clean and stable aquatic environment to remain healthy, thrive and live out their full lifespan. Establish a maintenance routine when you get your saltwater aquarium up and running so keeping the tank and water clean become second nature. 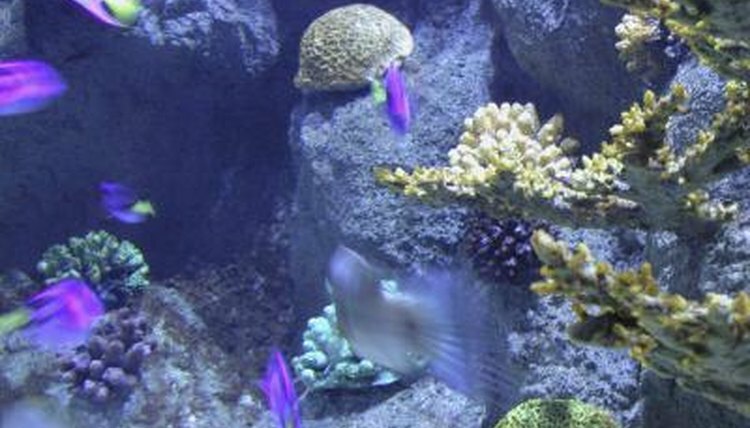 Install appropriate filters, heaters, lights and aerators made for saltwater aquariums and that were recommended for your particular tank inhabitants by a professional. Inspect the filters, heaters, lights and aerators every day to ensure they're functioning properly. Listen for odd sounds and see that they're operating smoothly. Run your hands along the wires and tubes to make sure everything's connected and plugged in. Check for leaks. Use a net to skim uneaten food and remove it from the tank every day. Typically, you feed the fish and invertebrates in a saltwater aquarium twice daily; remove leftovers about an hour after feedings. Purchase appropriate water testing equipment that reads the tank water's nitrite, nitrate, ammonia, pH and saline levels. Test every day or two until proper levels are naturally maintained, then test monthly. Appropriate levels keep your tank water clear and its life healthy. Empty the aquarium's protein skimmer collection cup every day or two to prevent any overflow and to keep it operating optimally. Wipe the neck clean about once per week to maintain efficiency. Check the water level every day and refill it to make up for volume lost through evaporation. If there's too little water, it becomes more readily clouded and your fish and other marine life may feel crowded and stressed. Wipe off any salt creep in and around your aquarium and its various parts. Salt creep is the crusty residue that accumulates on non-submerged surfaces exposed to saltwater. Use a damp rag and enough pressure to remove the residue. Remove algae buildup on the tank glass with an algae magnet at least once every week. Do so more often if necessary. The more proactively you stay on top of this task, the easier it is. Clean the exterior glass of your tank with a glass cleaner once per week to eliminate any smudges, stains or other dirtiness that can make your aquarium water appear to be less than crystal clear. Remove and rinse prefilter sponges every week to clear them of debris that can affect filter performance or be released back into your tank water. Follow all filter maintenance and care procedures outlined in the manufacturer's manual. Vacuum the gravel at the bottom of your tank with a gravel vacuum every one to two weeks. This removes droppings, food particles and debris that can taint or muddy your aquarium water. Perform 10 percent water changes every two weeks. Disconnect all the parts and power to your tank. Siphon out approximately 1/10 of the water carefully. This is a good opportunity to clean various parts due for some attention, too. Mix an appropriate saltwater solution and bring it to the same temperature as the aquarium water, then slowly add it into the tank. Reattach all parts and plug everything back in.  If you keep corals or certain invertebrates in your saltwater aquarium, add calcium and an appropriate buffering agent to your tank per the product's instructions. How Do You Hide the Pump in a Freshwater Aquarium?